Today's fancies theme is one that I always look forward to - the outfit crush. I come across enough outfits every week to fill up an entire board on pinterest. Not surprisingly, my last outfit crush was inspired by a very stylish blogger, as well. Julia of Gal Meets Glam has quickly become one of my daily reads. When she posted the adorable outfit above, I was smitten. I love the combination of pink and gold and the added edge of the black bag and shoes (click over to see them!). I took her cue and paired an animal-printed sweater with a black leather mini skirt - instant outfit crush. I am really liking the large graphic prints on sweaters and sweatshirts this season. The swan is elegant & stylish. Love that bag, too. SWOON! Love the animal print sweater with the leather and polka dot heels! Julia has such great style! I love your interpretation of this outfit. So fun! I love animal print sweaters. 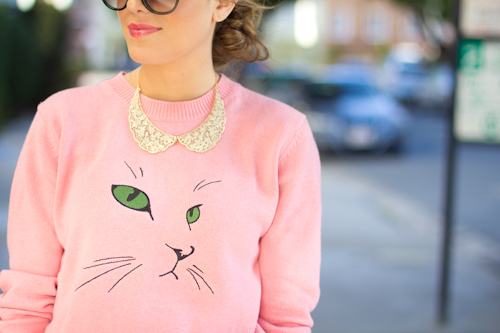 Fun, quirky sweaters are definitely one of my favorite trends for this season! love the outfit you created!! so fabulous and chic!! hope you have a lovely weekend!! those Kate Spade heels are sooo cute!! Love the texture of a sweater on leather! Love this outfit! I LOVE these picks! Its a great outfit!